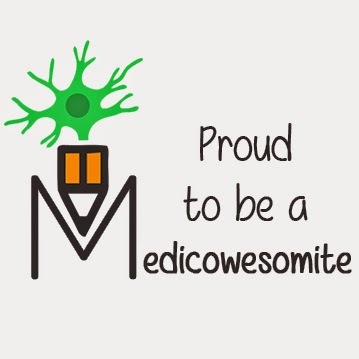 Hello awesomites! In this post we are going to discuss about STEMI. So, let's get started with pathophysiology of STEMI. 1) Atherosclerotic plaque in the coronary artery causes formation of the thrombos. However, in rare cases, plaque may be formed by emboli, congenital abnormality or coronary spasm. 2) In case of formation of the collateral circulation there is no STEMI development. When thrombos develops at the site of vasculature injury (Which may be aggregated by hypertension or increase in lipid content in the artery), two process initiates. Both process at the end causes formation of the clot. 3) Let us consider 1st process. This process involves platelets. Due to injury, there is change in the flow of the blood, which includes stasis of the blood. Slowly, this leads to the formation of the first layer of the lipid core which is potentiated by collagen, ADP, NA and serotonin. This also leads to platelets activation. Platelet activation means there is confirmational change in glycoprotien receptor 2b/3a on platelet. Receptors become adhesive due to which there is fibrinogen adhesion. Fibrinogen is multivalent protein so, it holds two platelet simultaneously! 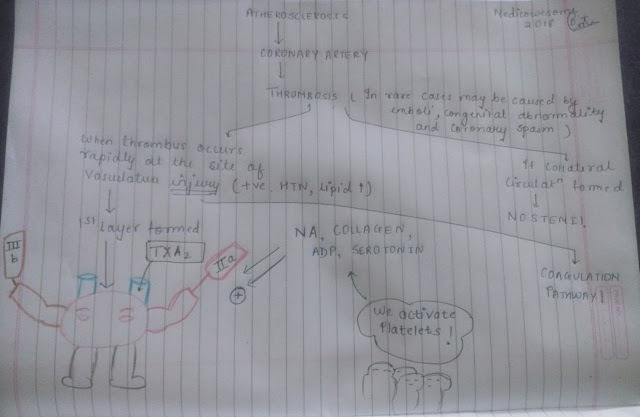 Also, there is increase formation of the thromboxane A2, which is the vasoconstricter causing further platelet aggregation. 4) Injury also causes exposure of cells to subendothelium which leads to activation of tissue factor. Due to this the external pathway of coagulation is initiated. This ends up forming clot with other process. 1) Pain is the most common presenting complaint. Pain is usually - Heavy, Squeezing and crushing! (Sometimes it can be Stabbing or burning). Pain is similar to angina pectoris, but it is more severe and lasts longer and occurs usually at rest. 2) ‎Typically it occurs at the central portion of the chest with or without epigastrium involvement and sometimes radiates to arm. Less common site of pain includes -Back, lower jaw and neck. Also, beneath the xiphoid process and episgastrium. Pain usually occurs at rest and does not subside with cessation of activity which is in contrast to angina pectoris. Pain is not uniformly present in patients with STEMI. Painless STEMI is seen in DM patients and also in old people. Note: In STEMI, there is no radiation of the pain to Trapezius. If in case, there is it is suggestive of pericarditis. 3) Also weakness, sweating, nausea and vomiting is also seen. Other less common symptoms include - Loss of consciousness, confusional state, arrhythmia and drop in pulse pressure. 1) Patient keeps moving in an attempt relieve pain. 2) ‎Pain + sweating + coolness of extremities commonly seen. 3) ‎Substernal chest and sweating for more than 30 minutes suggests STEMI. 4) Patients have normal blood pressure and pulse rate in 1st hour of onset. In 1/4th of the patients having "Anterior Infarction" there is tachycardia seen due to manifestation of sympathetic nervous system. Abnormal systolic pulsation caused by dyskinetic bulging of infracted myocardium. Leading to periapical area pulsation within 1st day and resolves on 1st day itself. On the other hand, in half of the patient having inferior infraction we see bradycardia and hypotension due to Parasympathetic hyperactivity. 5) Other physical signs: Ventricular dysfunction, 4th and 3rd heart sounds heard decrease in intensity of 1st heart sound and paradoxical splitting of the second heart sound. 6) ‎ Cardiac pulse decreases in volume, reflecting decrease stroke volume. 7) ‎ Temperature elevation upto 38°C in first week of STEMI.